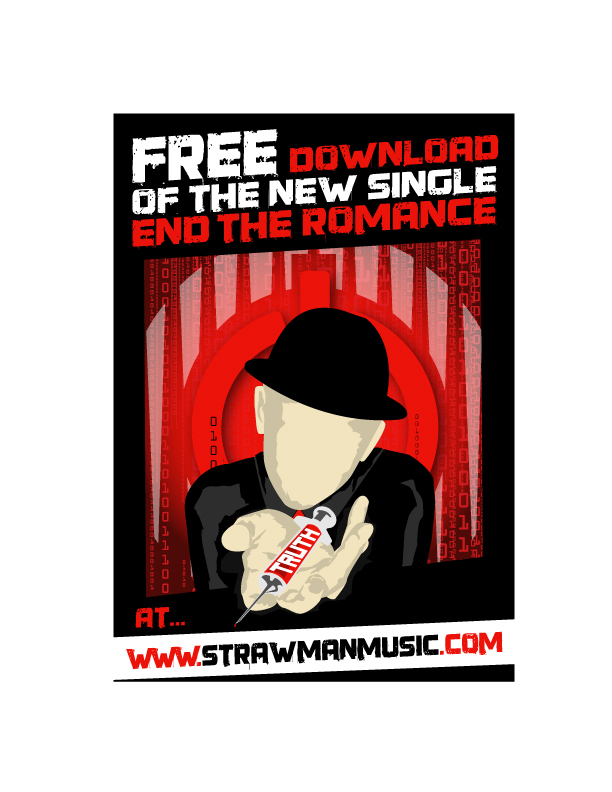 Get your free download of our latest single, End The Romance, when you “Like” STRAWMAN on Facebook or when you sign up to our newsletter. I’m reposting my video blog from 2 years ago – especially important viewing if you still believe the ‘official’ story about the attacks on the US that occurred 10 years ago today…. All the hubbub lately in the US is the debate over raising the debt ceiling in the US. It’s so much show, since everyone worth their weight who deals in finance knows this deal will happen, because it has to. It says here that the din you get on the news is there to adjust expectations of Americans as to what their vaunted government has available to them in terms of funds and the services the government will be able to offer. Allow me to reiterate – all the din you get on the news is to tell Americans they can expect less and will pay more to get it. Getting back to why this deal has to happen – can you imagine what happens if the US doesn’t send out social security payments? That alone will have a massive impact on the US economy let alone to US citizens. And social security payments are only the tip to the iceberg. Pundits are telling us that if Greece defaults it could cause a massive recession all over Europe. If the US were to default, the impact would be felt worldwide, and there’s not enough money out there to cushion the blow. So the deal will happen – what’s scary is that one day the US WILL default, and the bankers will be coming to cash in their bonds, regardless of what dire circumstances lie ahead. The Money System – it’s a great scam – and here’s how it works. Private banks around the world deal with private reserve banks in pretty much every country on the planet Earth. With fractional reserve banking, private banks are allowed to loan out over 90% more money than they actually have in their vaults and accounts. They take your $1 deposit and loan out $9, at interest. They’ve made $8 out of thin air and are making points off it. Do this often enough and you end up with every newborn baby born in the US owing about $250K in debt! Every year this number increases – it never decreases, and it’s the same in just about every country in the world. You would think that somewhere someone has to hold the IOUs, and they do – they’re called banks – the same banks that diddled and fiddled with our money and in 2008 needed billions more from taxpayers worldwide lest the economy collapse. The world’s debt can never be repaid (barring some incredible discovery of trillions of currently non-existent assets), because the debt to asset ratio is 10:1 or worse. So the banks make their points on money that truly doesn’t exist and is not backed by anything, and when those debts aren’t repaid they can come and get real assets in lieu of paper money. A great scam indeed. Any questions or comments – write me at strawman@rogers.com. One day early in 2011 the boys of STRAWMAN met at Co-Op Musical Machines studio in Toronto and began the adventure of making a song come to life. The trip to insanity followed step for step. End The Romance had been kicking about for awhile, but it was only this year we decided to capture the song for mass consumption and massive commercial success (yeah, right). 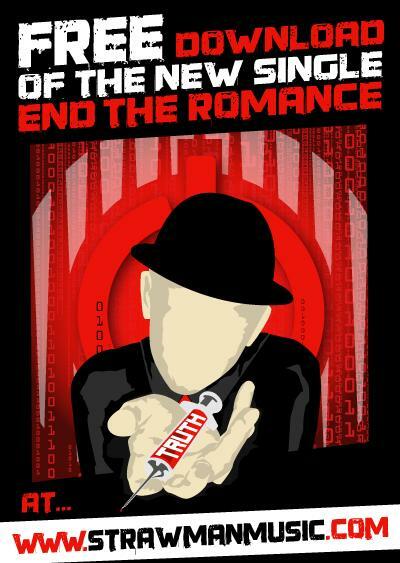 End the Romance is a song about addiction. Within the confines of Casa de STRAWMAN the song has become about addiction to the digital world. Twitter, Facebook, iPhones, Apps, 1000 channel television – you name it and most of us are addicted. Pretty soon your fridge will tell you when you need more milk – isn’t that awesome? I wonder what else it will be telling you, and even more interestingly, WHO else it will be telling. Yeah, perhaps I see the ongoing digitizing of the future as dubious, but why shouldn’t I? I’ll take a handshake over a friend request any day, and I can still tell when the milk is sour. At the rate which microchips are becoming instilled in our lives I wonder if future generations will have the same incredible skill of self-management, or will mothers of newborns have to ask their chipped babies when to change their diapers…. Now onto something less dour – here’s some behind the scenes footage of us in the recording studio. The video is so cleverly named ‘The Making of End the Romance’. STRAWMAN would like to thank Jezla Killz of RED and of Co-Op for recording us, CeeDee of aA Demented Production for doing the mixing, and Mr. Mystery for the final mastering.